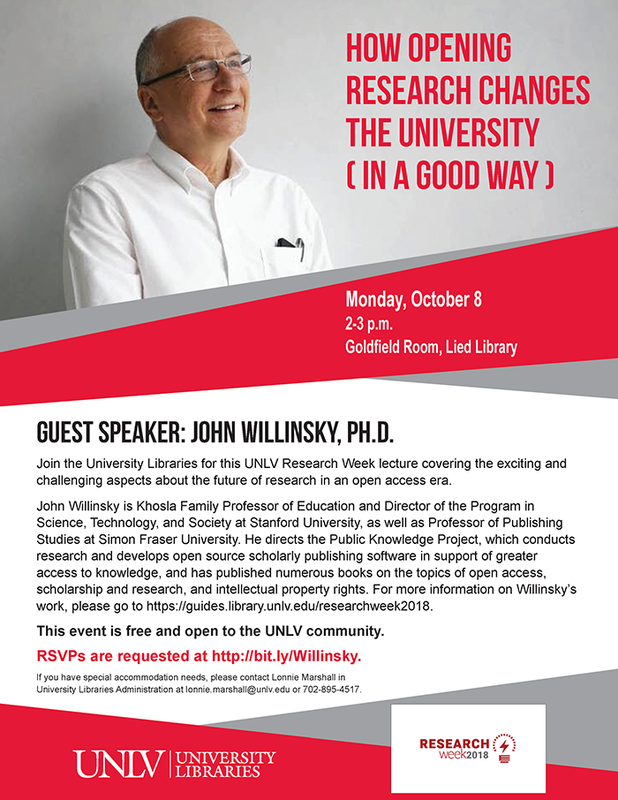 Guest Speaker: John Willinsky, Ph.D.
John Willinsky is Khosla Family Professor of Education and Director of the Program in Science, Technology, and Society at Stanford University, as well as Professor of Publishing Studies at Simon Fraser University. He directs the Public Knowledge Project, which conducts research and develops open source scholarly publishing software in support of greater access to knowledge, and has published numerous books on the topics of open access, scholarship and research, and intellectual property rights. If you have special accommodation needs, please contact Lonnie Marshall in University Libraries Administration at lonnie.marshall@unlv.edu or 702-895-4517.